I completed a batch of new bags today and will be adding them to the Pesky Cat Designs shop around 6PM today. Thought I would give you a sneak peek. Look for Harris Tweed, corduroy and faux suede. Stay tuned! You really use such gorgeous fabrics! 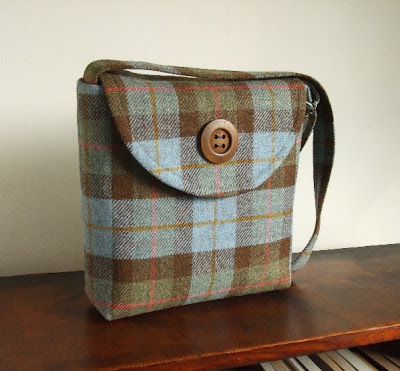 Gorgeous tweed - you realy have an eye for colours, the new bags look so calm and refreshing! Oh my...those two new messengers are really wonderful. And I love, love, love all of the birds! I adore the Harris Tweed. You certainly do it justice! I love the tweed! So fun. 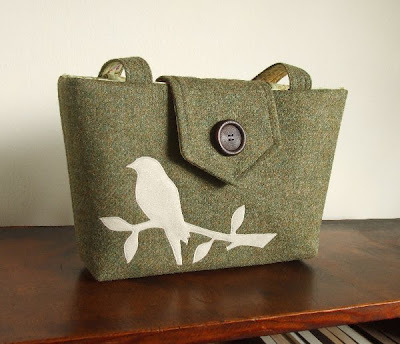 and I'm in love with your newest listing, the tweed messenger with bird applique - the loveliest peskycat so far! I was tagged by Loddelina yesterday! I like the tweed. Very nice. Would you be interested in doing a guest post? I just discovered your blog, and I love how crisp and inspiring it is--with the sprinkling of personal photos--the snowy street in NY, your studio...and of course your materials and beautiful bags!